"Supernatural" star Jared Padalecki wore an oversized hat and large jacket at LAX on Feb. 17, but that wasn't enough to hide his identity. A super fan spotted the 31-year-old actor, photographed him, and alerted the world via Twitter. We're guessing Jared, who was boarding a flight to Vancouver, was heading back to Canada in order to continue filming the ninth season of his hit CW series. Principal filming takes place in Vancouver. The super fan, known as @hauntologie on Twitter, posted the photo below. I'll be honest. I'm no "Supernatural" fan, so forgive me. 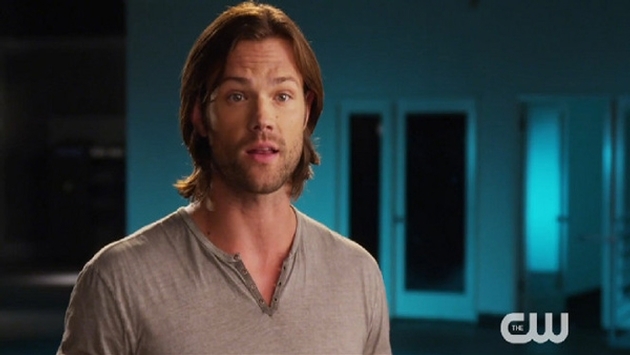 But Jared, who I am only aware of due to his exceptionally good looks, is known as Moose on the series. So when Becca asked her followers to name "this person" in the photo, many responded with "Moose." Lucky her. I have yet to spot a celebrity during my worldly travels. Anyway -- "Supernatural" was renewed for a tenth (yes, TENTH) season on Feb. 13. Jared was so excited by the news that he even offered up a storyline idea for the new season. And, theres already a season 10 storyline: Sam and Dean check into a retirement home, and NOT because it's haunted! #toooldforthis! What do you think of Jared's storyline idea? We can see this show going on for another 10 years, so we're not sure a retirement home would be the best option. Also, have you ever spotted a celebrity at the airport or on your plane? If so, tell us about your experience!